Our experience hiking Volcano Acatenango definitely had its shares of highs and lows–but by the end of our two day/one night excursion, one thing became abundantly clear: there was lots of important information regarding hiking Volcano Acatenango that either we or some of our group members missed. Don’t make these basic mistakes: read these tips for hiking Volcano Acatenango before you start your ascent. 1. Do NOT wear hiking sandals. , as I do everywhere these days, and while they have been perfect in just about every situation–not here. During the loose rock portions of the trail, I had to stop to dump my shoes out every few minutes, which not only slowed me down but hurt my feet along the way. If you have hiking boots–this is the place to wear them. 2. Rent a hiking stick at the bottom. When you reach the start of the ascent, hawkers will offer you a hiking stick for 5 quetzales (about $0.60 USD). GET THE STICK. It’ll be some of the best money you have ever spent. 3. Buy or bring a warm hat. We bought ours for 10 quetzales (about $1.40 USD) each from the same hawkers we got our sticks from, and spent the entire night saying how grateful we were to have them. 4. Bring many, many layers. It is incredibly cold at the campsite–the most comfortable girl among us was the one whose hostel had lent her a large and very fluffy coat. During the day, though, you’ll want to remove most of your layers. 5. Pack plenty of food. When we heard that there “wasn’t enough food”, we still expected to receive small meals–but really, even calling it that was an exaggeration. For a total of three “meals”, we each received: a bologna sandwich, a banana so bruised that 80% of our group threw them out without eating them, a cup of instant ramen, a pack of instant hot chocolate, and a small yogurt. Rather than thinking that food will be provided and you should bring snacks, think about it in the opposite way: you need to provide your food, and they’ll provide some snacks. 6. The going rate for the tour seemed to be 140-160 quetzales. We had people in our group pay anywhere from 140 to 300 quetzales. The couple that paid 300 quetzales was provided with slightly nicer food, but that was the only difference. Be sure to shop around! 7. Hire a porter if you need one. Porters are available to carry your bags up Volcano Acatenango for you. The cost is around 200 quetzales, plus tip. If you’re not used to carrying heavy camping equipment up a mountain, it could end up being some of the best money you have ever spent. Lacking a stable light source kept Jeremy and I from summiting Volcano Acatenango. While watching the sunrise over a volcano while sitting in front of a campfire alone certainly was memorable (and romantic!) in its own right, it was not fun to come so far and then be cut off. 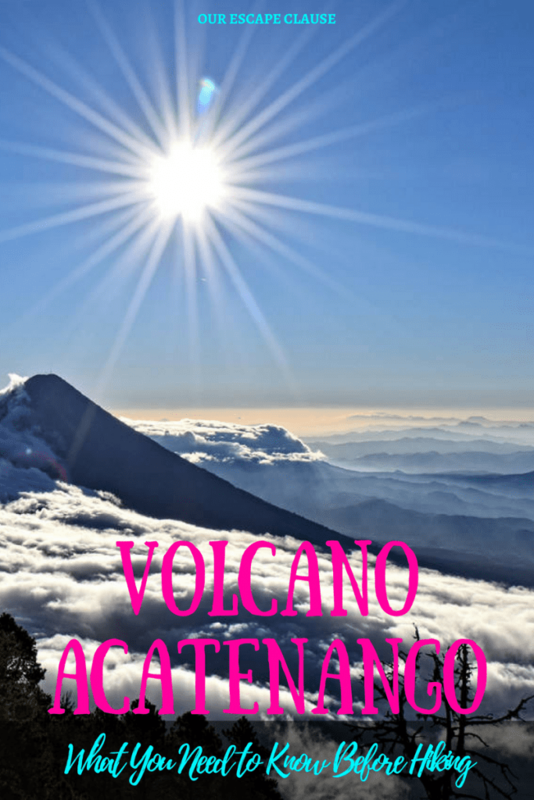 It’s hard to say which of these tips for hiking Volcano Acatenango is most important, but this mistake certainly stung us the most! We found inexpensive fleece gloves in Antigua’s supermarket for just about $2.00 USD. From what we could see, every group had a different pace–some guides stopped more, some less. Some groups had very strong hikers, some didn’t. Because of the variety, one of our tips for hiking Volcano Acatenango is simply that you’ll need to focus on pacing yourself, and, as hard as it is, don’t compare yourself to how fast others are going. 11. Pack as lightly as you can. Every ounce matters. There is more than enough that you have to bring–don’t bother with anything extra. 12. Don’t forget about the altitude. The hike up Volcano Acatenango starts at about 1500 meters above sea level and ends just under 4000 meters above sea level. If you’re not used to the altitude, you’ll be able to tell. 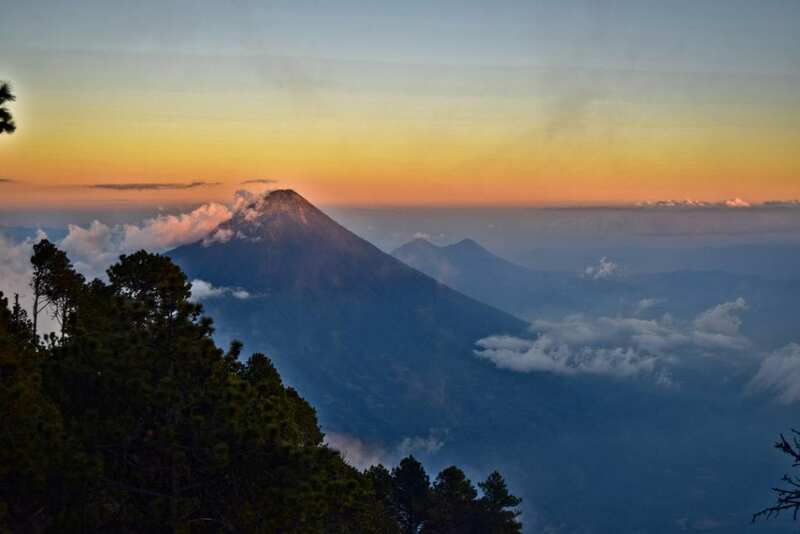 A few days won’t be enough to fix everything, but try to spend at least that long in Antigua or somewhere with a similar altitude before hiking Volcano Acatenango if you’re used to a lower altitude. If you’ve made the preparations, read our tips for hiking Volcano Acatenango, and you’re ready to sweat: good luck! If you are still hoping to hike a volcano in Guatemala, but don’t feel like Acatenango is a challenge you want to undertake, try Pacaya! Finally, this last tip likely goes without saying, but make sure you bring your camera! Some things are worth their weight in your pack, and you are definitely going to want photos of this. 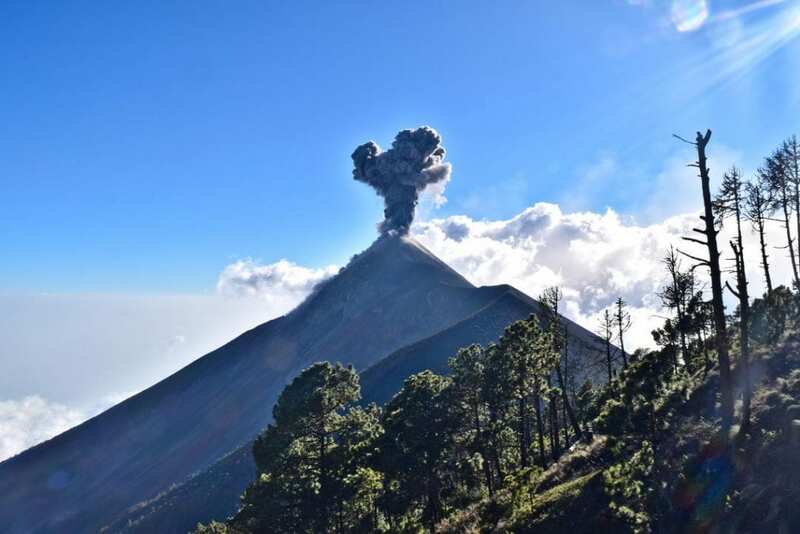 Nice to read your article about the Acatenango volcano with great shots! We have been thinking about this adventure quite a bit after doing it. 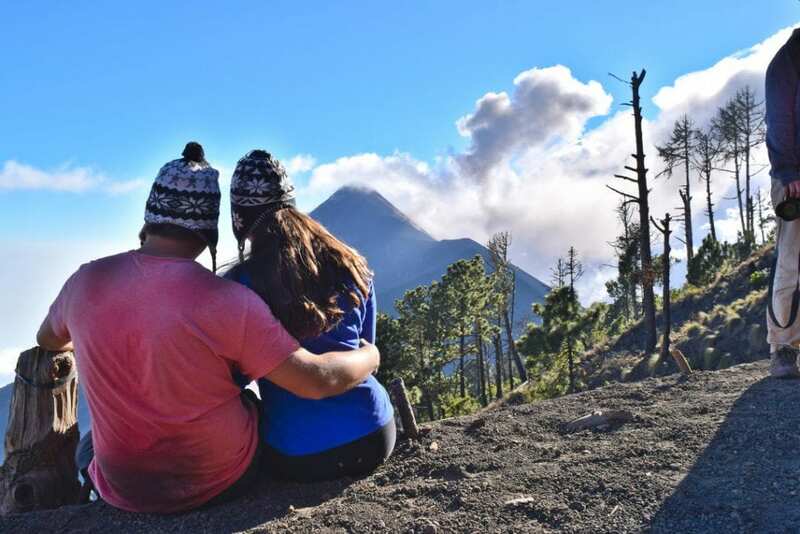 Another tip we gave our readers in the article we wrote: is that instead of joining a tour guide and a group, you can summit the volcano with two police officers who will keep you safe. You only need to buy food for them. And indeed, the layers, bonet and gloves are a must. We did not have any gloves, how we regretted that! Interesting! 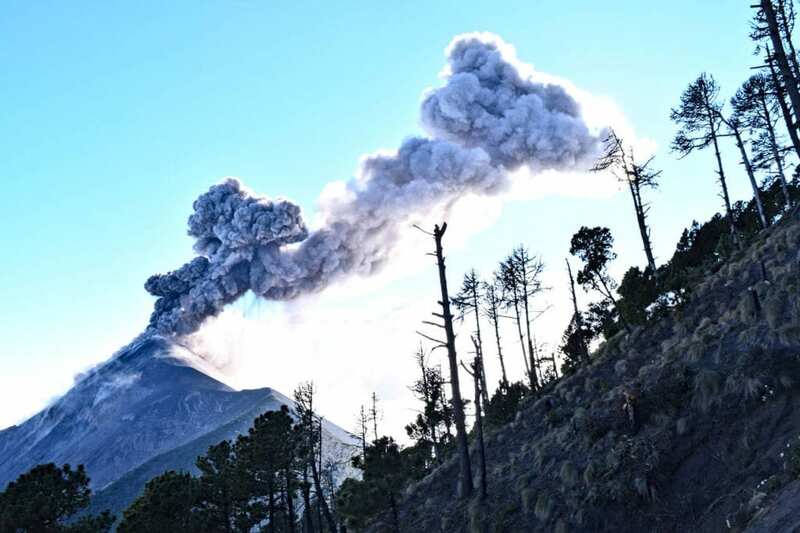 I had heard of people getting a private tour guide by using one of the locals on Volcano Acatenango, but the only place I’d heard of people using near Antigua was on Volcano Agua.